This a complete tutorial on manually installing November 2018 Android 8.0 Oreo official firmware on Samsung Galaxy A7 (2018). Announced few months back, Samsung’s upper class A series smartphone is finally recieving new November 2018 security definitions. Unfortunately, this update doesn’t carry any sort of Android version upgrade, which users were expecting by now. Seeing how the brand is currently focused on launching Android Pie for its flagships first, we can only expect the new OS to arrive soon after that. Nonetheless, we recommend you read our guide ahead to manually install November 2018 firmware on your Galaxy A7 (2018) to avoid security issues and bugs. Galaxy A7 (2018) has been a surprise in many ways. Its the brand’s first triple lens camera phone in many markets and also it arrives with a side-mounted fingerprint scanner, yet another first. 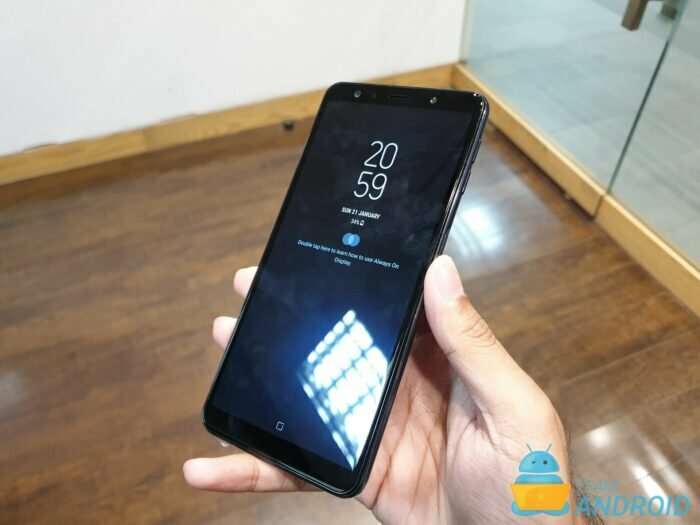 We had some hands-on time with the device for which have covered our thoughts here: Samsung Galaxy A7 First Impressions. Despite the lack of Android version change, you should definitely install the new update. More often than not, along with improved security, these updates carry other improvements as well. Before heading further, make sure you have correct USB drivers installed and the data cable — preferably official — at hand. Further, it is also advised to maintain a complete backup of all user data on your phone before updating. The steps ahead are intended to work with Samsung Galaxy A7 (2018) only. Disclaimer: Please use this guide at your own risk. We, at TeamAndroid, would not be held responsible if you brick or generally mess up with your device. Further, the firmwares, system files or apps used are property of their respective owners. This update carries November 2018 security patch which was released by Google. Containing security fixes, the build also contains other minor improvements and bug-fixes. This firmware tutorial applies to various Galaxy A7 (2018) varaints. The specific model numbers supported through this guide are mentioned ahead. To make sure you own the correct Samsung Galaxy A7 (2018) model / variant, go to Settings > About phone > Model number. Also, you can consult our Galaxy A7 (2018) Model Numbers and Variants article. USB Drivers: Samsung Galaxy A7 (2018) Drivers and How to Connect with Computer. Recovery Mode: How to Access Recovery Mode on the Samsung Galaxy A7 (2018). Install Android Pie: How to Install Android 9.0 Pie on Computer. Custom ROMs: For a complete collection of Samsung Galaxy A7 (2018) custom ROMs, click here! If you plan on rooting this phone or are still confused for why to root Galaxy A7 (2018), read: Benefits of Rooting Your Android Device. Download Samsung Galaxy A7 (2018) USB drivers! All set and ready? Good. You can now continue reading below and update Galaxy A7 (2018) to Android 8.0 November 2018 official firmware update. Ahead, we have a detailed step-by-step procedure through which you can update Samsung Galaxy A7 (2018) to Android 8.0 November 2018 build. The firmware is an official one signed by Samsung and we will utilize latest ODIN to flash it onto Galaxy A7 (2018). Please read every line carefully and make sure you read the tutorial once before actually performing on your device. This tutorial is only for Samsung Galaxy A7 (2018). Please don’t try this on any other variants of the phone. Firmwares used in this post are official releases by Samsung for the Galaxy A7 (2018). Step 1 – Download November 2018 Android 8.0 update from the following links for your specific Galaxy A7 (2018) model to your computer and extract the zip file. Step 2 – Download Odin which will help you to install November 2018 update on Samsung Galaxy A7 (2018). Step 3 – Switch OFF your phone. Now go to Download Mode. How? Press and hold the Volume Down + Bixby buttons together, and then press the Power button till you see the construction Android robot and a triangle. Press Power again to confirm to enter into Download Mode. Read: How to Enter Download Mode on Galaxy A7 (2018). Step 4 – Make sure you have your Galaxy A7 (2018) USB drivers installed on your computer.